Organized in the fall of 1942, Iowa, the all-black Thirty-Second and Thirty-third Women’s Auxiliary Army Companies would become the first contingent of WAACS assigned to a military installation in the United States during World War II. Composed of nearly 200 auxiliaries and seven officers, company members completed six weeks of intensive training in Iowa before reporting to Fort Huachuca, Arizona, on December 4, 1942. At the time, the army post was the largest black military post in the country. There, the units were assigned to the Ninth Service Command and the post headquarters, respectively. Under the command of the first group of Fort Des Moines’s graduating class of black commissioned officers—Irma Jackson Cayton, Vera Ann Harrison, Frances Alexander, Violet Askins, Natalie Donaldson, Mary Kearney, and Corrie Sherard—auxiliaries ably performed clerical and administrative work as stenographers, typists, telephone switchboard operators, clerks, messengers, reception ists, and motor pool drivers and mechanics. 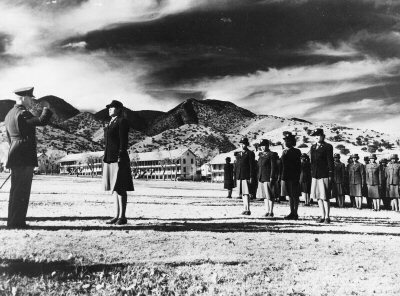 The positions held by the WAACs and the duties they performed cohered with the racial and gendered employment policies developed by senior Army leaders and Women’s Auxiliary Army Corps officials, relieving the men of the U.S. Ninety-third Infantry Division also stationed at the military outpost to undergo extensive field training in the Arizona desert. Upon their arrival, auxiliaries of the Thirty-second and Thirty-third companies quickly enhanced the training programs at Fort Huachuca. The successful performances of Auxiliaries Priscilla Taylor and Reba Caldwell while working with a Ninety-third Infantry division convoy during its desert training exercises garnered admiration and praise from the post commander, Edwin Hardy, and division personnel. And WAAC recreational officers Geraldine Bright and Mercedes Jordan created All WAAC Musical Revues, Glee Clubs, and USO comedies, providing precious moments of levity for the uniformed servicewomen and men training at the desert installation. Yet the formal presence of the WAAC company servicewomen and officers and the duties they performed while stationed at the military post were subject to intense scrutiny grounded in prevailing sexual stereotypes and innuendo at nearly every turn. The Thirty-Second and Thirty-Third Post Headquarters Companies continued to serve at Fort Huachuca, Arizona before being disbanded in late 1945. However, many of its senior officers were subsequently reassigned to other military installations throughout the United States or deployed for overseas duty with the 6888th Central Postal Directory Battalion in Europe later in the war. Robert F. Jefferson, Fighting for Hope: African American Troops of the 93rd Infantry Division in World War II and Postwar America (Baltimore: The Johns Hopkins University Press, 2008). Brenda L. Moore, To Serve My Country, To Serve My Race: The Story of the Only African American WACs Stationed Overseas during World War II (New York: New York University Press, 1996).